Following the Russian Revolution in October 1917 the Bolsheviks began rapidly remaking the country. On July 10, 1918 the newly written Russian Constitution renamed the country the Russian Socialist Federated Soviet Republic (RSFSR). On October 19, 1918, a decree from the Council of People’s Commissars of the RSFSR created the Volga German Workers' Commune out of areas within the Saratov and Samara provinces that were heavily populated by ethnic Germans. The decree stated that the Council intended to “pursue the goal of consolidating the struggle for socialist liberation of German workers and the German poor of the Volga region." The decree developed principles that were strongly supported by the Charter of Volga Commissariat on German Affairs and backed by the unanimous wishes expressed at the first Congress of the Council of Deputies of the Volga German colonies. From its founding to May of 1919, the administrative center of the Volga German Workers' Commune was the city of Saratov. 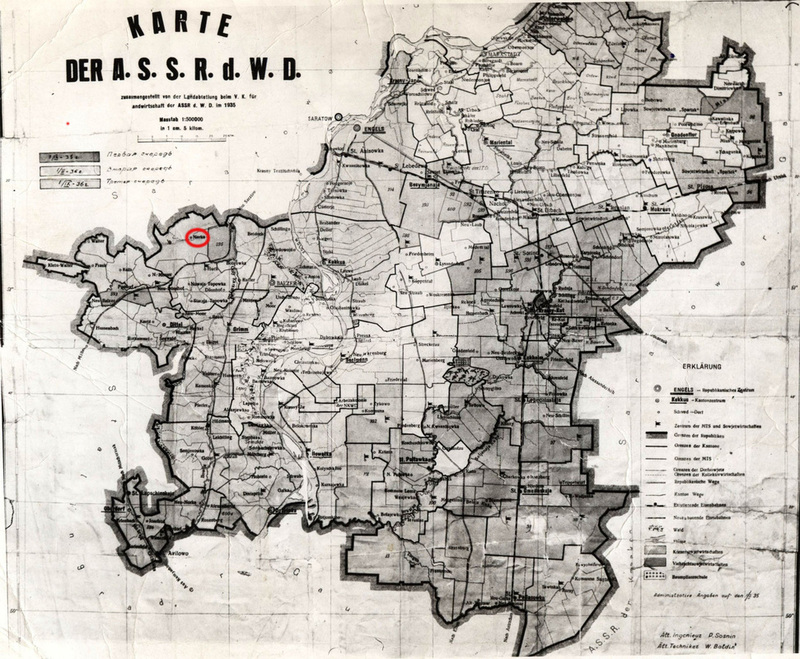 The administrative center then moved to the town of Marxstadt (from May to June 4, 1919 — Yekaterinenstadt). The commune was comprised of three districts (known in Russian as an uyezd): Golokaramyshskiy with its center in Goly Karamysh (the colony of Balzer), Yekaterinenstadtskiy with a center in the town of Yekaterinenstadt (later Marxstadt), and Rovensky — with its center in Rovnoye (the colony of Seelmann). In 1919, the pastors in the German colonies were labelled counterrevolutionary propagandists and many were sent to Gulags in Siberia. Norka pastor, Friedrich Alexander Wacker, was an exception as he continued to serve his parish until he was exiled in 1930. 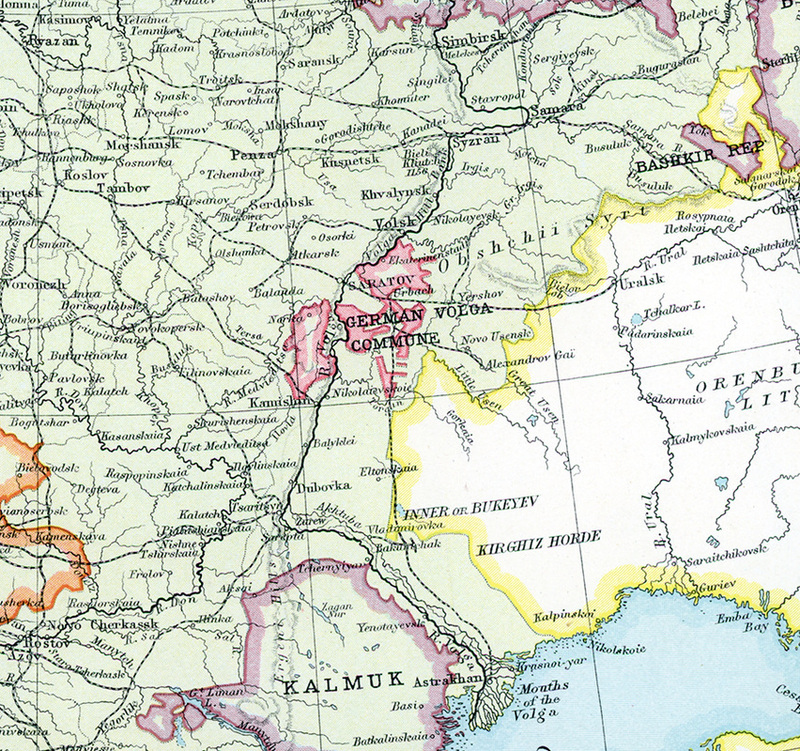 Map dated 1924 showing the post-revolution Volga region as it was between 1918 and 1922. The Volga German Commune is depicted in red and Norka is shown to the extreme north of the area on the west side of the Volga River. Source: Steve Schreiber. 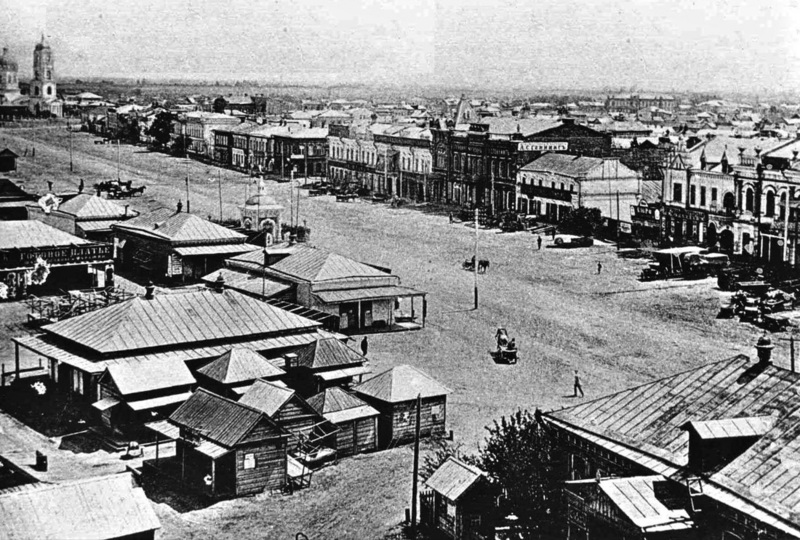 Photograph of the city of Engels circa 1900. Source unknown. The new autonomous republic was formally declared on January 6, 1924 at a meeting of the First Congress of the Volga German ASSR. At this five day meeting in Engels its first government (the People's Commissars or Central Committee) was elected. The new Volga German ASSR was unique in being the only ASSR established in the USSR for a diaspora group as opposed to a nationality indigenous to the territory of the USSR. The Volga German ASSR occupied the territory of 28,200 square kilometers in the lower part of Volga region, which bordered on Saratov, Stalingrad (today Volgograd) provinces and the Kazakh SSR. The 1939 census numbered its population at 605,500 people, where Germans made up about 60 percent of the population. 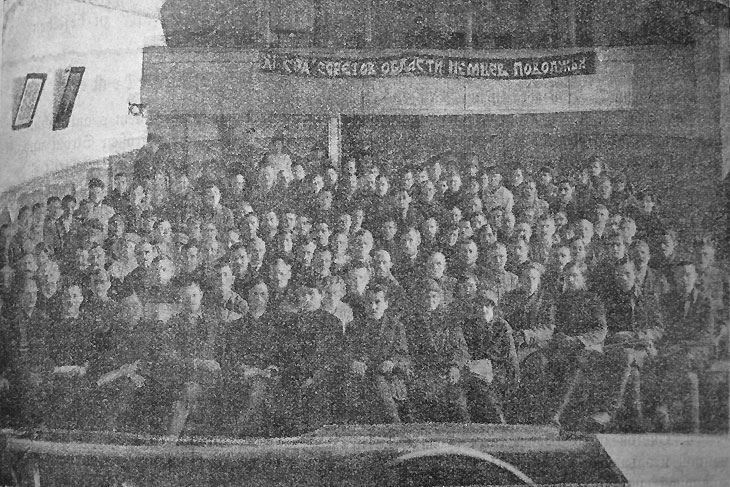 Participants of the 1st Congress of Soviets of Autonomous Republic of the Volga Germans, January 6, 1924. Source: "Unsere Wirtschaft", 1924, Nr. 5, Page. 127. The new ASSR was divided into fourteen administrative cantons (districts). Norka was part of Canton Balzer. 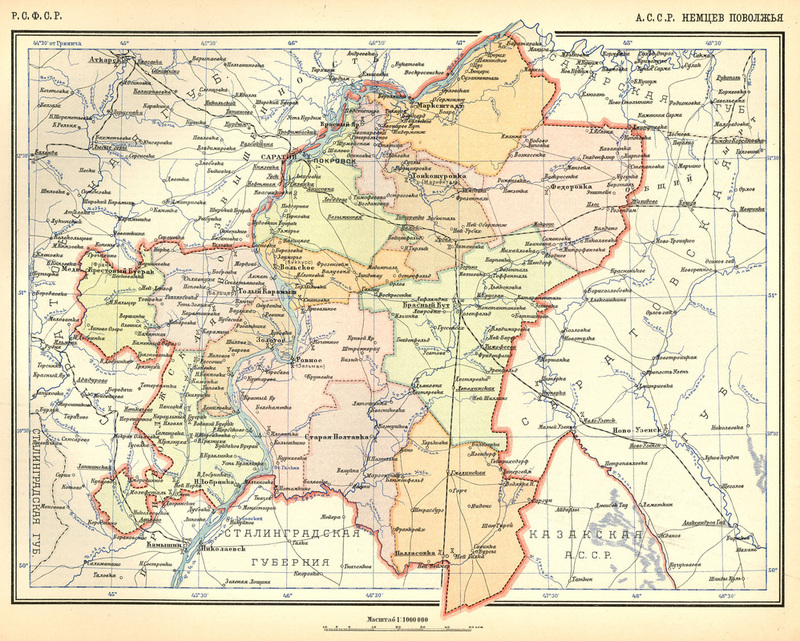 Map of the Volga German ASSR from 1928. Norka (норка) is shown near the northwestern boundary line. Source: Wikipedia. The decree authorizing the formation of the Volga German ASSR stated that all the governing power within the territory belonged to the Executive Committee which was elected by the Congress of Deputies of Volga German colonies and local Councils of German workers and the German poor. Disagreements between the Executive Committee of the Council of Deputies of Volga German colonies and the provincial Councils of Deputies were settled by the Council of People’s Commissars and the Central Executive Committee. One of leaders of the Volga German ASSR was Adam Johann Reichert, a native of Norka, who served as the Chairman of Regional Executive Committee of the Council of Deputies of the Volga German colonies. The decree specified that the cultural life of German colonists, including the use of their mother tongue at schools, autonomy in local administration, courts, and social life, was not subject to any limitations, in accordance with the Soviet Constitution. 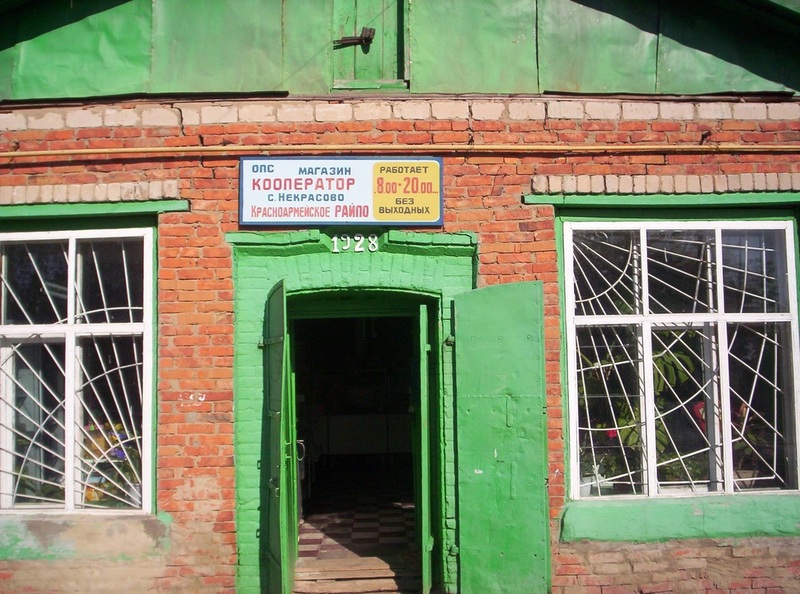 From 1926 to 1928, the government built a cooperative store, an agricultural credit cooperative, two primary schools, and a reading room in Norka. Prior to World War II, four collective farms were founded and all private farms were discontinued. New developments in Norka included a power plant, hospital, secondary school, an orphanage, a day nursery, and a library. A 2011 photograph of the Norka cooperative store built in 1928. Courtesy of Nina Donath. 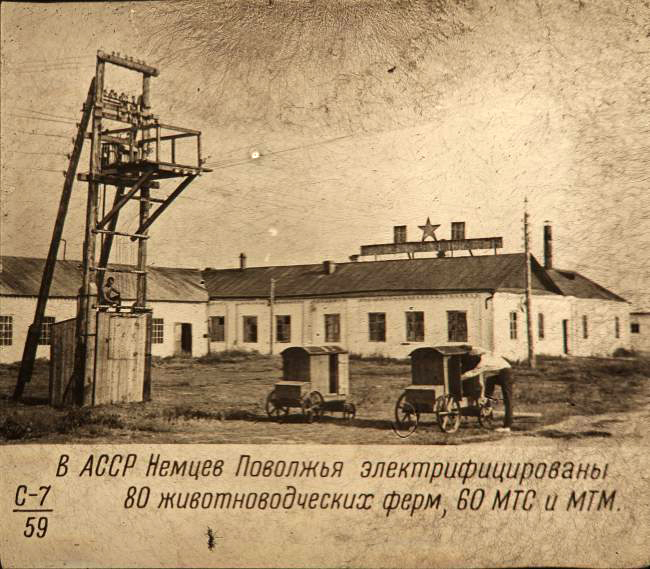 Photograph depicting the installation of electricity at a cooperative farm in the Volga German ASSR. Source unknown. On February 3, 1930 a special regional commission was formed to focus on the liquidation of the kulaks. This was class warfare aimed at suppressing and eliminating those with anti-Soviet views, those who employed others, and so called "wealthy" farmers. Kulaks were arrested and subjected to trials with predetermined outcomes. They were often killed, exiled to Siberia, or moved to remote locations outside of the collective farms. On January 9, 1931, the regional committee of the CPSU of the Republic of the Volga Germans in consultation with the leadership of the Soviet Union decided to create a German agricultural institute composed of three departments: industrial, agricultural, and grain/dairy farming. ​​On April 29, 1937 the Congress of the Soviets adopted the Constitution of the Volga German ASSR. Cover of the Constitution of the Volga German ASSR approved in 1937. Articles 110 and 111 described the coat of arms and the flag. The coat of arms was published for the first time on the front page of the newspaper "Bolshevik" (published in Engels) on July 10, 1937. Coat of Arms of the Volga German Autonomous Soviet Socialist Republic. Source: Wikipedia. The first known flag of the Volga German Republic was adopted in 1926. 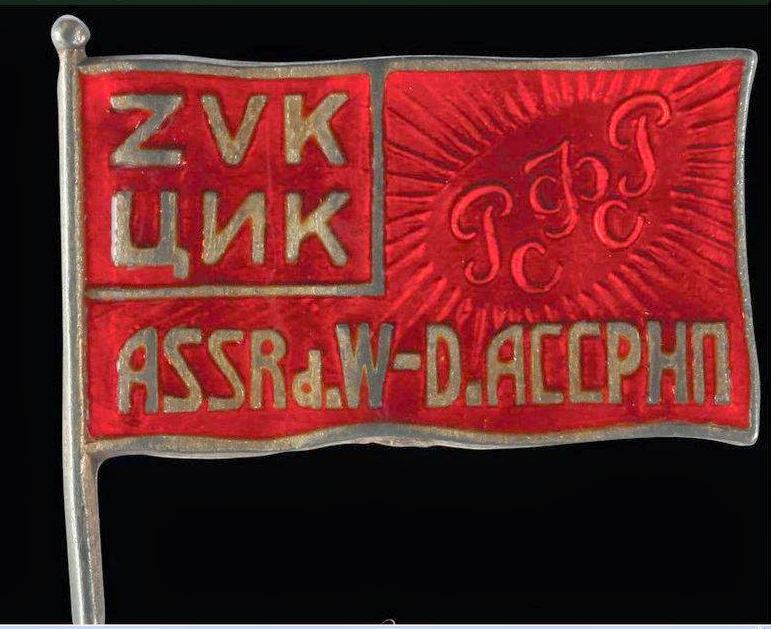 It was red flag with golden letters represent the Sozialistische Sowjet Republik of Wolga Deutschen (SSRWD). Source: Wikipedia. Second (and last) flag adopted in 1937 or in 1938, red background with inscriptions in Russian and in German: "ASSR of Volga-Germans". Source: Wikipedia. In 1937, a Machine and Tractor Station (MTS) was established in Norka. The MTS were rural agencies that supplied kolkhozy (collective farms) with agricultural machinery (tractors, harvesters, trucks, etc.) and the people to run the machinery. 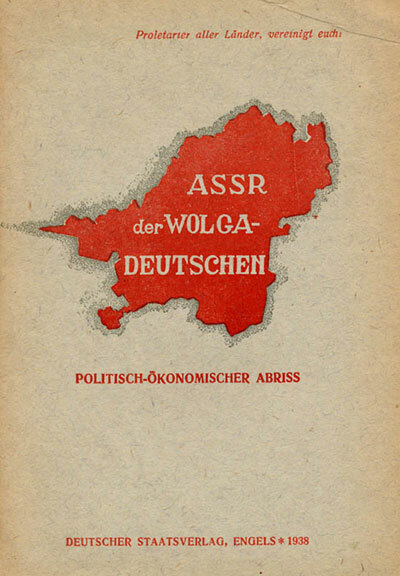 The Volga German ASSR was among the first regions to establish an MTS in 1928. The MTS were supposedly established when the kolkhozy were too weak and disorganized to manage their own equipment. The MTS also served as a Communist party (and police) stronghold in the countryside. By 1940, the Volga German ASSR was considered one of the leading regions in the mechanization of agriculture. Some of the machinery was supplied to the Soviets by American companies such as Fordson and McCormick-Deering. 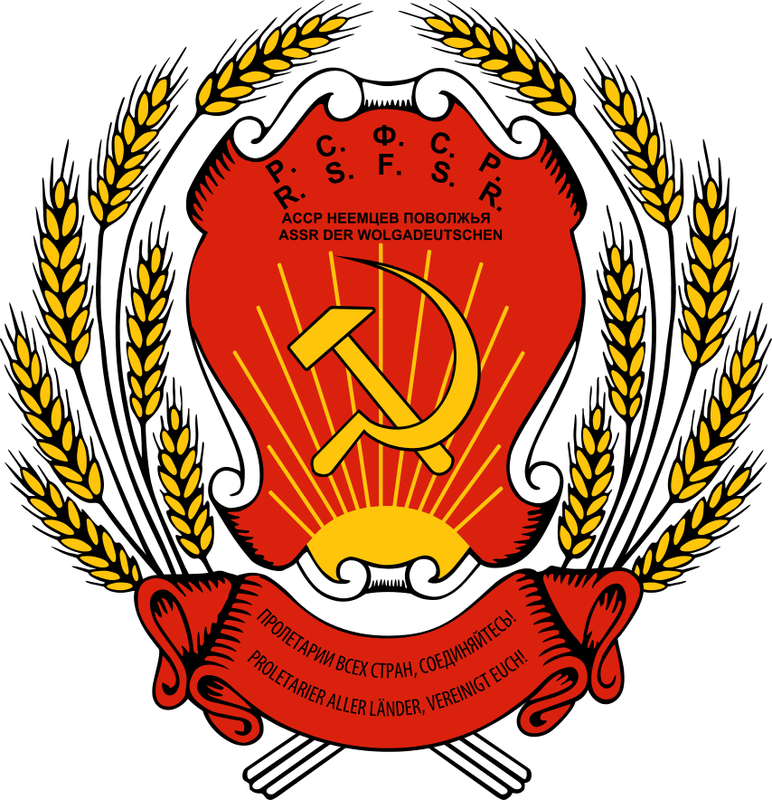 The Volga German ASSR was one of the oldest independent republics of the Soviet Union. In many ways, it was a success, both economically and culturally. Soviet Germans developed their own national culture in a socialist context. The republic was developed to become one of the most advanced agricultural areas in the Soviet Union. Intensive and modern farming techniques were first introduced in the Volga German ASSR. Over time, republic also experienced a rapidly growing set of industries. The Volga German ASSR was one of the first republics with universal literacy, with 171 national high schools, 11 technical schools and 5 universities. In addition, there were 172 cultural centers (many were established in former church buildings), the German National Theatre and the Theatre for Children. Twenty-one newspapers were published in the German language. For three years (1933-1935) the Engels based Deutscher Staatsverlag (German publishing organization) released 555 German language books. According to data published in the 1992 Soviet census materials, in 1937 there were: 322,652 Germans, 106,466 Russians and 1989 representatives of other nationalities living in the Volga German ASSR. In total, there were 489,929 people living in republic. As relations between the Soviet Union and Germany became more tense in the late 1930's, the attitude towards Germans in the USSR began to change for the worse. With Hitler's invasion of Russia in June of 1941, the entire population of Russian Germans were declared to be enemies of the Soviet state, despite the fact that many served in the Soviet government and military with honor. The Presidium of the Supreme Soviet of USSR decreed on August 28, 1941 that all ethnic Germans (including the leadership of the Volga German ASSR) were to be deported to remote regions of Russia (primarily Kazakhstan, Uzbekistan, and Siberia) and that German schools and colleges, libraries, and institutions be closed. 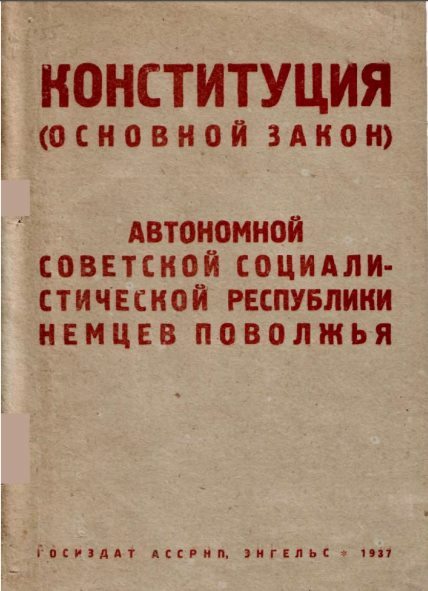 The cover of a 64-page booklet titled "Autonome Sozialistische Sowjetrepublik Der Wolgadeutschen" (Autonomous Socialist Soviet Republic of the Volga Germans) published by the Deutscher Staatsverlag in Engels, Russia. The cost for the booklet in 1938 was 40 kopecks. Source: Steven Schreiber. 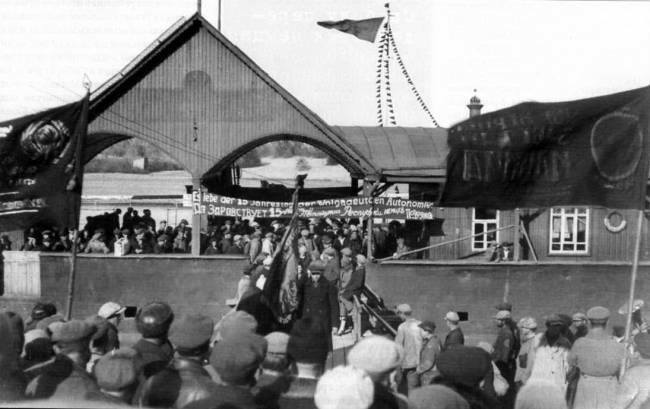 Following the banishment of all ethnic Germans, the Volga German ASSR was abolished on September 7, 1941, and its territory was inherited by Saratov and Stalingrad (later Volgograd) provinces. With very few exceptions, all Germans had been ethnically cleansed from this region, ending a way of life that began with Catherine the Great's Manifesto in 1763. On September 8, 1941, the People's Commissar of Defense issued a Directive to remove all ethnic Germans from the military and they were sent to the Trud Armee (Labor Camps) operated by the NKVD. In a remarkably short amount of time, all that had been accomplished by Catherine's Manifesto had been undone by the Soviets. After World War II and Stalin's death, many of the repressed people of the USSR were rehabilitated and their autonomous republics were restored. This was not the case for the Volga German ASSR. Map of the Autonomous Soviet Socialist Republic of the Volga Germans in 1935. Norka is circled in red. Source unknown. A small flag pin worn by members of the Central Executive Committee of the Autonomous Soviet Socialist Republic of Volga Germans. In German the initials are ZVK ASSR d. W-D. The other set of letters are in Russian and mean the same thing. In the upper right corner in red letters are the letters RSFSR (Russian Soviet Federated Socialist Republic) in Russian. Source: J. Otto Pohl. 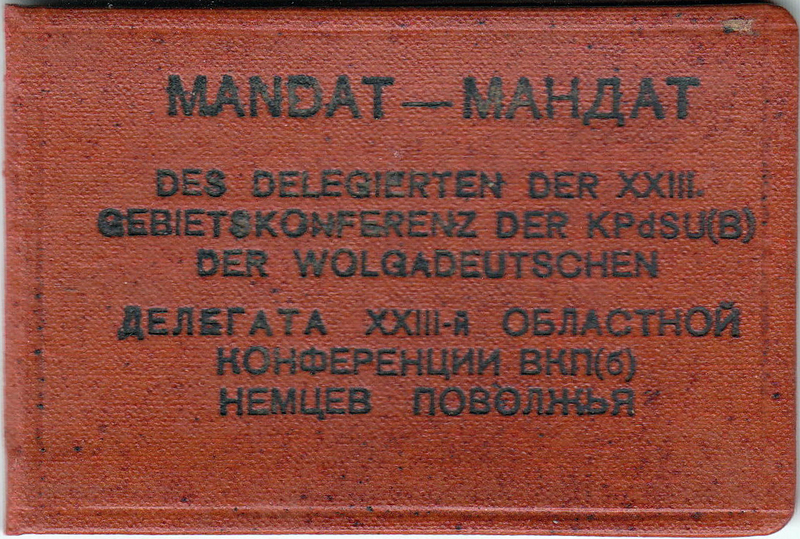 The cover of an identification card showing the owner to be a delegate of the 23rd Regional Conference of the Communist Party Soviet Union (Bolshevik) of the Volga Germans. Source: Tanja Schell. Inside pages an identification card showing the owner to be a delegate of the 23rd Regional Conference of the Communist Party Soviet Union (Bolshevik) of the Volga Germans. Source: Tanja Schell. "Labor Commune (Autonomous Oblast) of Volga Germans Was Founded." Yeltsin Presidential Library. n.d. Web. 10 Dec. 2014. <http://www.prlib.ru/en-us/History/Pages/Item.aspx?itemid=697>. Herman, A. A. German Autonomy on the Volga - 1918-1941. Ed. 2nd. M.: ICSU-Press, 2007. Krieger, Viktor. Secret Criminal Proceedings against the Last Volga German Government during the Years 1944-46. Lincoln: Published by American Historical Society of Germans from Russia, 2005. Web. <https://ahsgr.site-ym.com/store/ViewProduct.aspx?id=5334324>. "Machine and Tractor Stations in the ASSR of the Germans of Volga Region." (Russian Language) Encyclopaedic Dictionary. N.p., n.d. Web. Sept. 2015. <http://wolgadeutsche.net/lexikon/_MTS.htm>. Pohl, J. Otto. Ethnic Cleansing in the USSR, 1937-1949. Westport, CT: Greenwood Press, 1999. ​The Republic of the Volga Germans webpage. 25 Sep 2016.